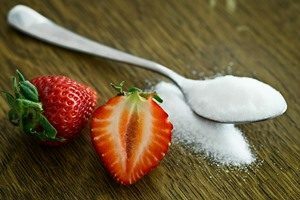 Sugar – everyone’s best friend or should I say enemy? We turn to sweet treats for comfort, give each other chocolates during special occasions and reward ourselves with some sweet tooth satisfaction for a job well done. Basically, sugar has become a constant companion in most of our lives. Unfortunately, this “friend” of ours is addictive as a drug and is detrimental to our health. And because of that, it’s time to let our frenemy go. While it’s still high in fructose and calories, raw honey contains vitamins, minerals and anti-oxidants unlike table sugar that is highly processed and stripped of all nutrients that the body needs. Honey is also sweeter and denser than table sugar which means that people may actually use less of it. This nature’s candy is low in calories and an excellent source of fiber, calcium, iron, folate, Vitamins K & B-6 and minerals such as potassium, manganese, magnesium and copper. There’s also Date Sugar which is basically dried dates pulverized into a powder which is great for baking. Like honey, pure maple syrup doesn’t also go through an in-depth refining process which means that it still contains amounts of calcium, iron, magnesium, potassium, zinc, copper and manganese. When buying maple syrup, make sure to check ingredients and watch out for those that contain high-fructose corn syrup and artificial colorings, flavor and sweeteners. Pick out PURE maple syrup that only contains evaporated maple tree sap. A cup of unsweetened apple sauce contains 102 calories and only 23 grams of sugar while the same amount of granulated sugar has 774 calories and 200 grams of sugar! Apple Sauce is perfect for baked goodies plus, it’s a good source of fiber, vitamin C, thiamin, riboflavin and potassium. You know how healthy bananas are, right? It’s contains potassium, fiber, manganese and Vitamins C & B6. They become sweeter as they ripen which makes them a healthy sugar alternative for desserts and a dairy-free base for your milkshakes and ice creams. Lastly, we have the most well-known natural sweetener in the market – stevia. A packet of stevia is low in calories while Stevia extract in liquid form contains no calorie at all. But just like refined sugar, stevia is also processed and doesn’t contain nutrients.